Fascinated by polymorphic art that changes form as the observer shifts viewing angles, my work provides the magic of dynamically changing with variations in light, color, shadow and perspective. I developed my unique style over 30 years ago while completing my Master’s Degree at Indiana University. After happily residing on my wall for 7 years, the pieces of wood suddenly began to fall one by one as the glue eventually failed. Past lessons inspired the time-consuming process of precisely cutting and hand sanding each dowel, creating pilot holes in both the hand painted dowel and back panel, then securing each piece so they are individually screwed, not glued, ensuring permanence. This particular piece of artwork became a labor of love, as the planning process alone took several months before even picking up a paint brush or attaching a single dowel. After creating a conceptual drawing, I then translate the illustration into carefully placed circles on an acetate template which is used for drilling starter holes on the shellacked and painted back panel. The design phase can be tedious, and I do not use any technology like computers or projectors, it is truly a hand-made project with the compass being my most mechanical drawing device. The words “Tulip Mania” are also incorporated into the central tulip and stem in a subtle way that “pops” or “flashes” in proper lighting conditions. The three-dimensional dots of vibrant acrylic color and a holographic medium unite to convey form in a Gestalt of optical illusion. I strive to create art that is non-static with a multi-dimensional and shape-shifting quality. I want the viewer to participate in the metamorphosis and dynamic nature of my artwork. I have worked with stained glass and love that iridescent color luminescence and wanted to bring that to my painting. Light and angle of viewing alter the perception of the piece. My goal is a visual alchemy that melds color, light, shadows, form, negative space and pattern into an energetic totality. 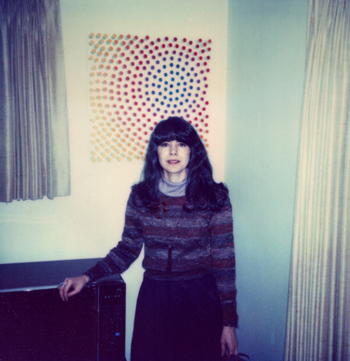 It makes me happy to see the viewer pause and move back and forth in front of the artwork. Over ten years ago I started experimenting with the holographic medium in my art, which for me adds some magic and mystery into the mix. Using this material has been a true love/hate relationship. When an artist uses a material that is unconventional there can be a long learning curve, and there are no guidelines or instruction manuals, so there exists a lot of trial and error experimentation. This medium is very temperamental and toxic, so it has been tricky and sometimes requires reworking multiples times. My perfectionist nature causes me to do something over and over again if I feel it doesn’t work as intended, down to the right color paint and smallest details. 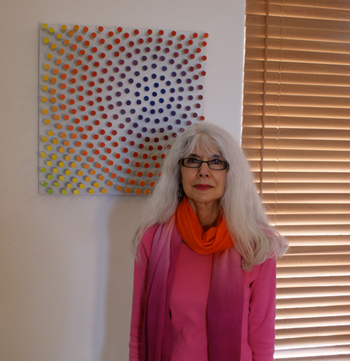 As Larry Poons stated about his art it is "food for the retina, and optically alive." For me it is like Shinobu Ishihara meets Ben-Day Dots with a nod to pointillism. 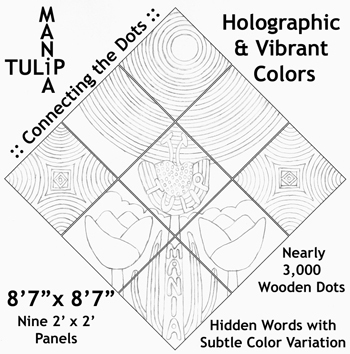 Living in Santa Fe where there are so many artists and galleries, it is important for me to do something unique and original, and that is what I have strived to accomplish with Tulip Mania Connecting the Dots. 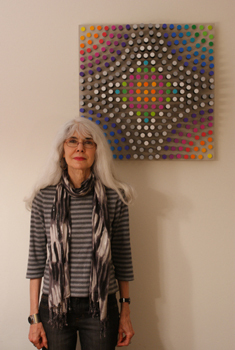 Jody standing beside one of the nine panels that was featured at World of Art Showcase.